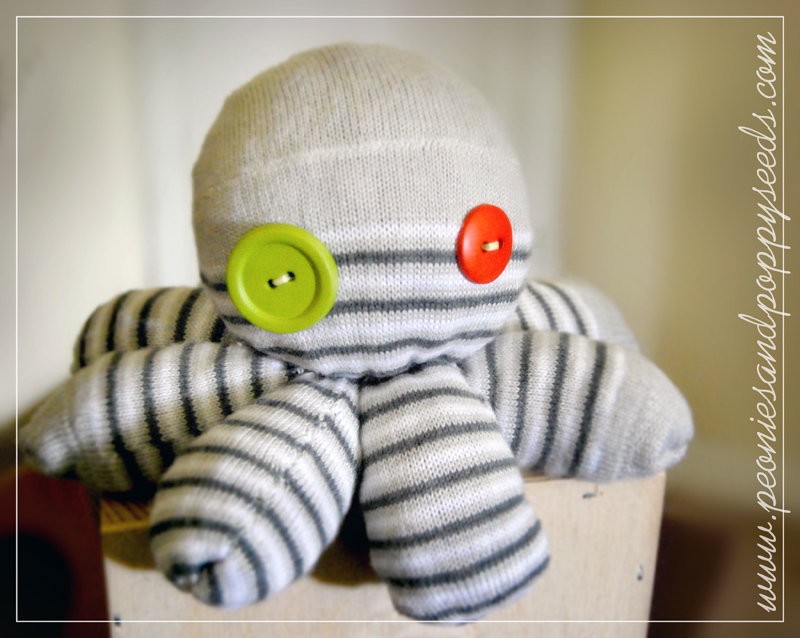 If you woke up this morning thinking, "Man, I really want to make a beanbag shaped like an octopus, but all I have is this lousy pair of socks," then BOY HOWDY, do I have a project for you! 1- Get a pair of socks (they can be new or old, however they CANNOT be stinky). You'll also need some beans, a needle and thread, scissors, and a couple of buttons. 2- Cut your socks so that you have the leg parts of both and one toe. 3- Now cut the leg parts into fourths - you need eight legs so cut each sock leg in half the long way and the short way. 4- Turn each leg piece inside out and sew down the long side and across the bottom. Leave the top open. Do this for each leg. 5- Put some beans in the toe part you have cut - this is going to be the head. Fill it to your desired head size (I kind of overfilled mine so it would stretch to a little bit bigger size). Then sew the bottom of the head closed by taking stitches all the way around the opening and pull them tight. 6- Now fill a leg with beans. 7- Sew the bean filled leg onto the bottom of your head. Make sure it's on there really really really secure-like. 8- Repeat steps 6 & 7 for all of the legs. This is what the bottom should look like. 9- If your leg stitches are secure you should be able to hold your octopus by the head and jiggle it with the legs hanging comfortably and not precariously. 10- Take a little scrap of left over sock and sew it around the very bottom where all the legs are sewn on. This way you won't have any rough sock edges showing. 12- You're all done! And see, it totally wasn't hard at all. And now you have just what you wanted - a beanbag in the shape of an octopus made out of a pair of socks! Now you can play games, or use it as a mini exercise weight, or let your kids throw it at each other, or squeeze it when you're stressed out, or maybe you could just use it to keep your papers from flying all over when the ceiling fan is turned on. Beanbag sock octopuses (octopusi?) are really good for lots of things.